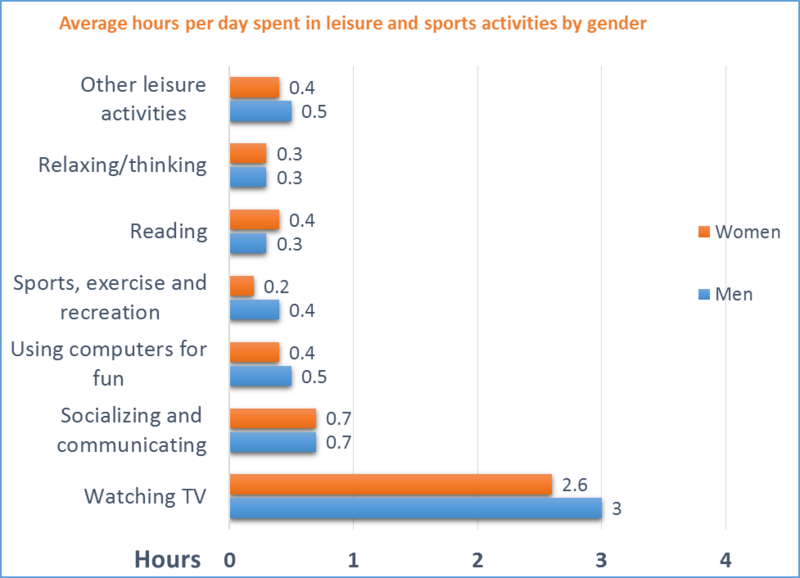 The bar chart below provides information about the time spent in leisure activities by males and females in the USA in 2014. The bar graph compares the amount of time men and women expended every day in different leisure and sports activities in America in 2014. One striking feature of the chart is that watching TV was the favorite free time activity for both the genders. On average, males spent 3 hours daily in front of their TV sets while women spent 2.6 hours. Socializing and interacting with family and friends was the next most preferred form of recreation. Both men and women spent 0.7 hours per day on this activity. Leisure activities, sports, exercise and using electronic devices like computers were more popular among males. On the other hand, the opposite was true for reading as females expended 0.4 hours daily on this activity whereas men spent merely 0.3 hours. Interestingly, thinking or relaxing were equally popular among both sexes. This form of entertainment accounted for 0.3 hours daily for both men and women. 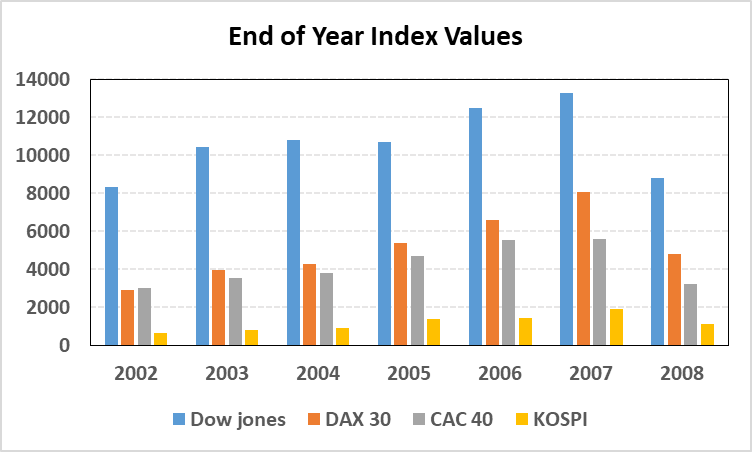 The bar chart provides information about the variation in the end of year values of four main international market indices over a period of eight years between 2002 and 2008. Looking at the details, the American index was the strongest in each of the eight years. 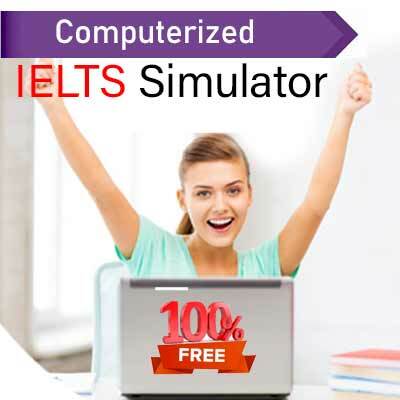 In comparison, the values of other three indices were considerably less than that of USA. Starting off at just over 8000 points in 2002, the US index reached its peak value of around 13000 points in 2007, before dropping off to its lowest level at nearly 9000 points in 2008. The German market index was the second most valuable throughout the given period, peaking in 2007 at about 8000 points before witnessing a 3000 point drop in value by the end of 2008. There was a tight correlation in the value and performance of German and French markets. The value of French market index was less than that of the German index in each of the years except 2002. Even though the Korean market index had a similar performance trend, its value was the lowest. Overall, what stands out from the data is that all four of the market indices rose steadily in value during 2002-2007, but there was a sharp drop in their values in 2008. Notably, Dow Jones, the American market index, was the highest valued index throughout the period in question whereas KOSPI, the Korean market index, was the lowest valued index. The line graphs below show the number of police officers and criminals in two cities since 2005 and predicted figures up until 2025. 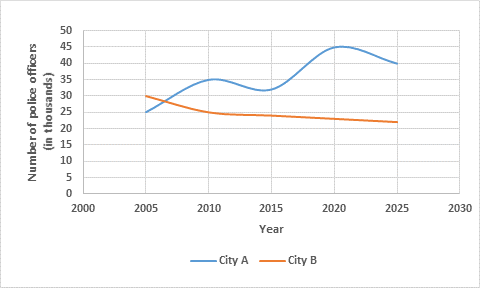 The line graphs illustrate the variation in the proportion of police officers and offenders in two cities, city A and city B, over a period of two decades between 2005 and 2025. In 2005, city A had 25000 police officials whereas the number of officers in city B was comparatively higher, 30000. In the next 5 years, city A experienced a significant rise of 10,000 in the proportion of its police officers. In contrast, the trend for city B was downward and the numbers dropped to 25000 in 2010. 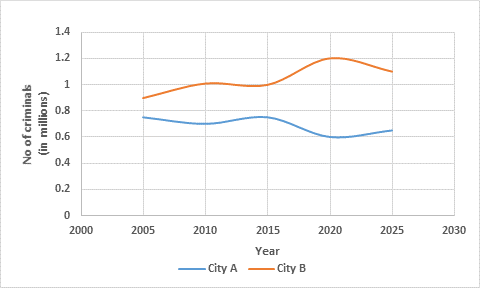 Between 2010 and the present, city A’s police figures fluctuated while that of city B decreased slightly. According to future predictions, the number of police officers in city A will reach the mark of 45,000 in 2020. These figures are expected to decline to 40,000 in 2025. In comparison, city B will have only about 22,000 police officers between the present and 2025. According to the second line graph, the number of criminals in city A and city B stood at nearly 0.9 million and 0.7 million respectively in 2005. In the next decade, city A’s figures dropped slightly while that of city B rose gradually to 1 million. In the future, city A will have about 0.6 million offenders. In contrast, the numbers in city B will be significantly higher, in the range of 1.1 to 1.2 million. The tables below show the distribution of students at UK universities by mode of study and gender. The tables compare the proportion of males and females enrolled in full-time and part-time postgraduate courses at UK universities in four academic sessions between 1996 and 2010. It is evident that student enrolments in full-time courses followed an upward trend for both the genders throughout the given period. The number of males rose from 75,370 in 1996-97 to 151,275 in 2009-10 while that of females increased from 62,344 to nearly 146,980 during this period. These figures also indicate that there was a gender disparity in full-time postgraduate programmes. In 1996/96, the gender disparity was the highest (75,370 males versus 62,344 females) but the distribution became more balanced in the following years. Focusing on part-time courses, overall more students were registered in these programmes as compared to full-time ones. 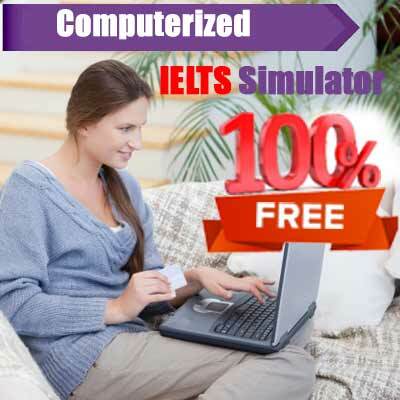 In 1996-97, about 114,000 males and about 109,000 females selected part-time courses. In the next two academic years, there was a rapid increase in the percentage of female students whereas the number of male entrants fluctuated. The year 2005-06 had the highest enrolment rate in part-time programmes for both sexes, 138,505 males and 172,640 females. Notably, the number of students dropped in 2009-10.